For the first time ever… we have a guest blogger. 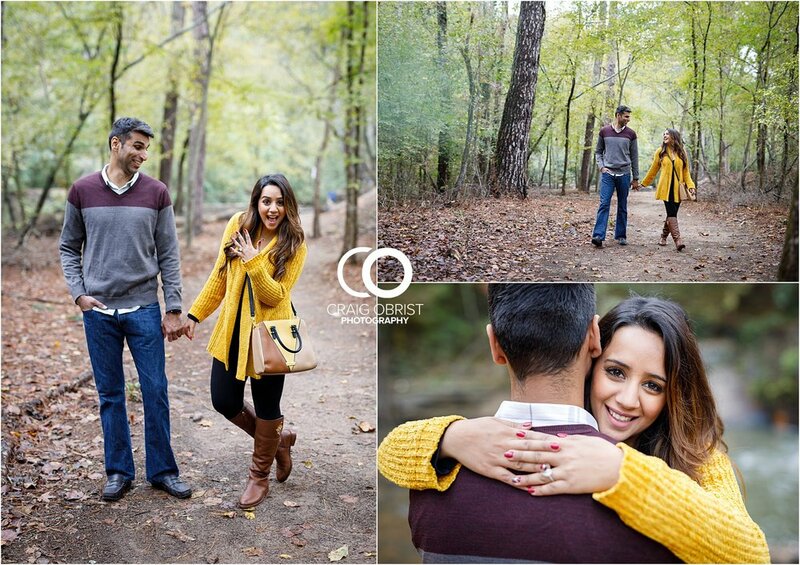 :) Khurram planned a surprise proposal for his lady, and here’s her side of the story. ENJOY! 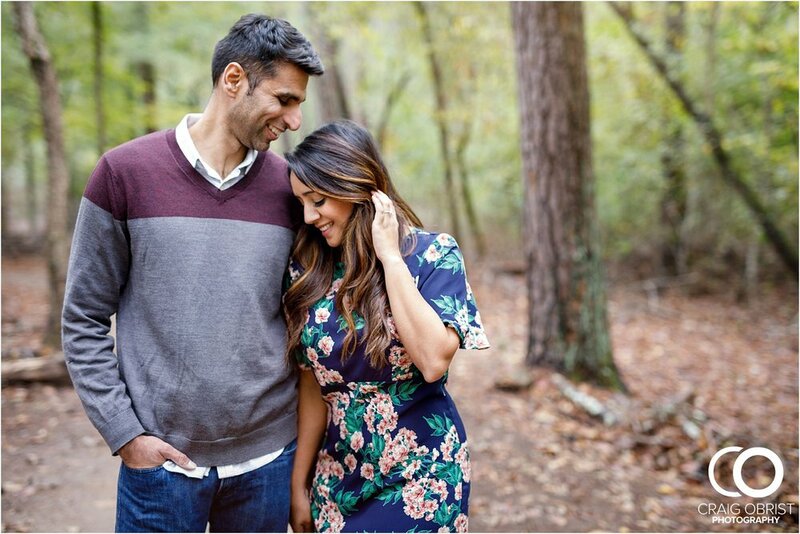 I had a fall family shoot planned in the morning with Khurram’s neighbor Teresa, which some context there - a few weeks ago Kay had gone over to Porth’s house to watch football and came back all excited that he happened to mention that Manisha couldn’t come because she was editing and they were like oh she’s a photographer? And he talked me up and Teresa added me on Instagram and reached out for her photos! 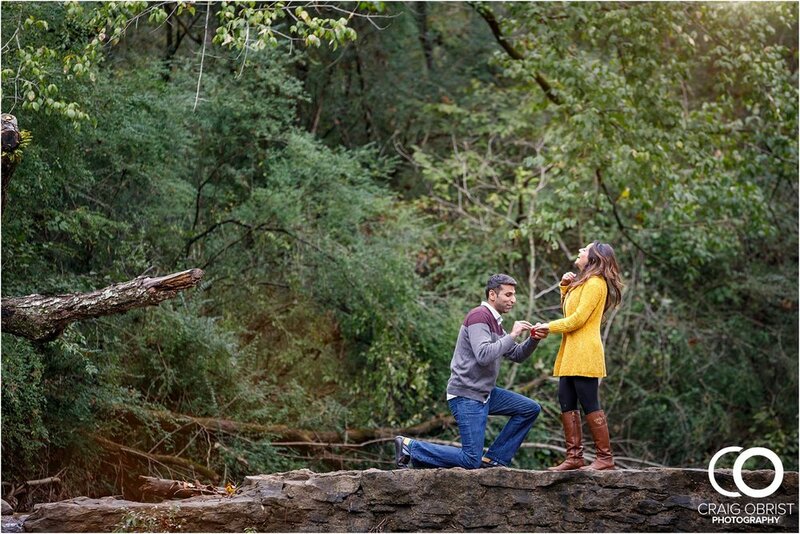 Well I was so touched and excited to expand my reach, I didn’t think twice when she picked Freeman’s Mill Park, which was like an hour from my house! I was confused why she picked some random place so far, in the cold, with her one year old kid. The wk of I almost cancelled because it had rained and it was going to be cold, but Teresa was like no let’s do it; well if my client was down I was in too! 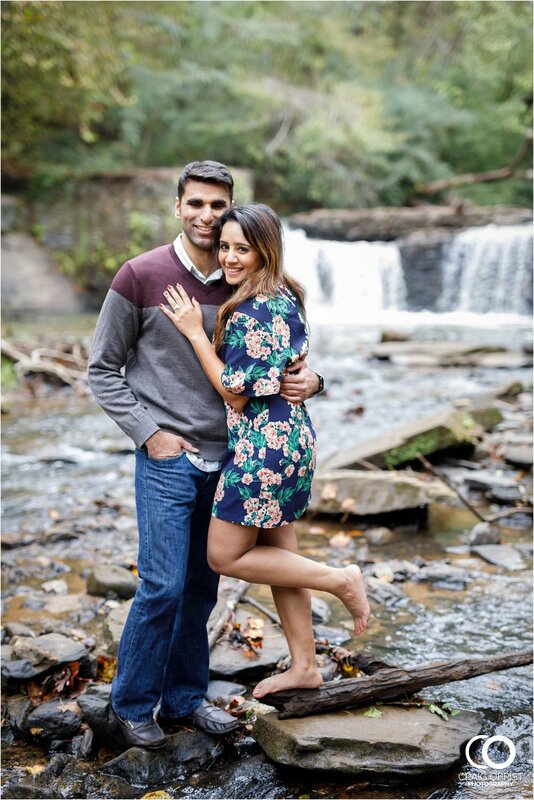 He took my hand and walked me to the edge of the waterfall, I was so in shock I kept laughing (and complaining) that I had no ideaaaaa and I wanted to wear something else in this moment, why didn’t you warn me! Haha that wouldn’t be a surprise then i know. How is he so good?! He was so sweet, he had gotten one of my fav photographers, Craig Obrist, to capture the moment so I was even more excited/nervous. Then he goes on to tell me, seeing my “oh snap, I got punked!-Little makeup-no dress-totally surprised face”, don’t worry, I brought you half your closet in my trunk! LOL this man is a keeper. But first, he gets down on one knee and...honestly, I don’t remember what he said..he held both my hands, told me he loves me and wanted to marry me in that order, I think...and I said YASSSSSS! This was it, this was the moment I was wishing for - to find that one that filled my life with so much happiness, the guy who would be my best friend, life partner, and love forever. They all told me to trust the timing of our life, to believe that there is someone out there that will get you, like really get you, and love you unconditionally. This feeling has me smiling nonstop. 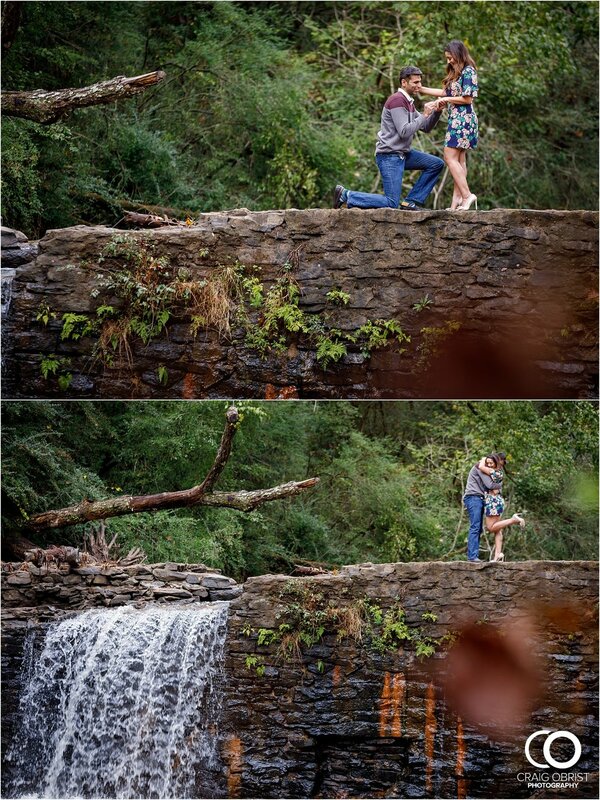 I hope we always remember how we felt on that moment, on the edge of a waterfall when he asked, and I said yes. So we went to the car to change, I had been shopping for this surprise for months but none of my options were here because I wasn’t expecting anything today so naturally i didn’t have it all laid out or anything lol but he brought the works, all my jeans, lots of random tops, dresses and even my fancy Louboutin shoes! Haha so sweet!!! Eventually I found a navy floral dress that I loved with some sparkly champagne heels. Time for some photos with Craig. 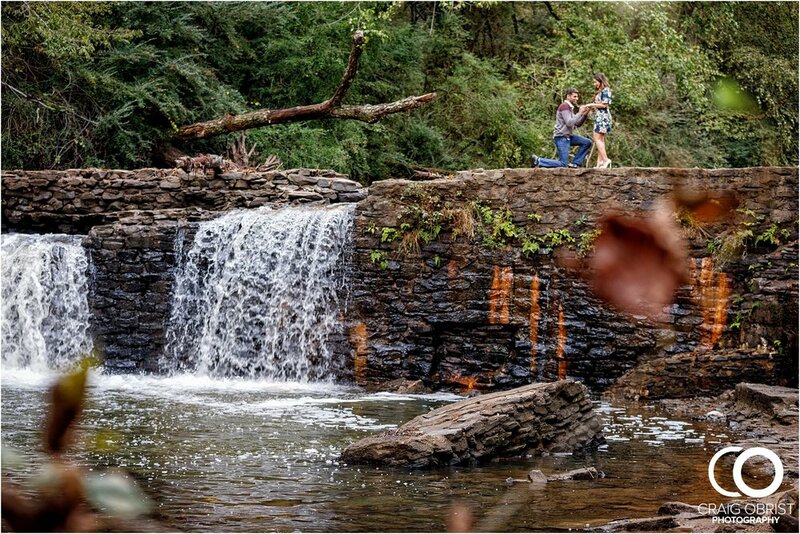 I made Kay propose again at the waterfall, this time with my heels and all. Hehe, are you surprised? Lol after our photos Kay rushed me saying we have lunch reservations in Buckhead we have to go! We walked into Bangkok Station to see like 20 of our nearest and dearest friends waiting to celebrate!!!! This day just keeps getting better!! He had been planning this for weeks and then invited everyone literally the day before and they all came - melted my heart! Afterwards I went home to shower lol so I kinda hadn’t showered in two days haha, I got my lashes done on Thursday, and then had them fixed on Friday so I couldn’t get them wet lol luckily I had gotten my nails just done the day before. Haha I knew the boy had a ring and he kept teasing me that it could happen anyyyy day, just be ready and well I didn’t listen because if I had I woulda kept dry shampoo, makeup and a perfect outfit in my trunk at all times. LOLLL but you know what, he nailed the surprise!! He had me thinking it would be November, like for sure maybe Nov 10 or my birthday? But he did so good. This was perfect! like they just can't wait to go. In the evening we went and had dinner with his parents, they were so excited and happy! We got calls and texts from my family and friends and there was just so much positive energy, my heart was full. Feels surreal, like this is a whole new season in my life. I’m thankful and humbled by all the love. It was a good day. Actually, it was the best day!